Bill Clinton and childhood friend Mack McLarty meet presidential candidate Barry Goldwater during a campaign stop in visit to Northwest Arkansas. In the 1960s, Bill Clinton’s political career began. 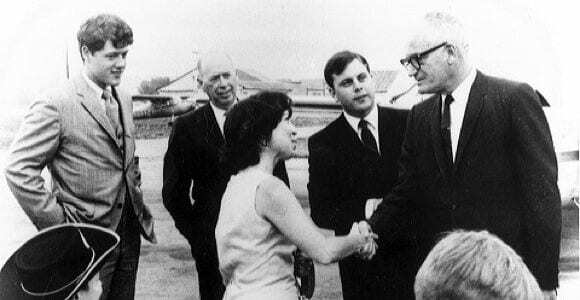 Clinton (pictured far left) is seen here in 1968 in northwest Arkansas with David Mullins, University of Arkansas president, Mack McLarty, University of Arkansas student body president, and U.S. Senator and former presidential candidate Barry Goldwater.